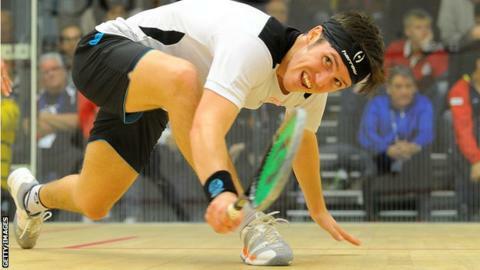 Guernsey's Chris Simpson says he is now targeting a top-five world ranking. The 27-year-old recently broke into the top 20 in the world rankings for the first time in his squash career. Simpson told BBC Radio Guernsey: "I'm still reasonably young compared to the guys ahead of me. My long-term goal is to reach the top five in the world. "That's a long way off at the moment but my next goal is to try and break into the top 16 and, from there, there are a lot more mini goals to achieve. " He continued: "There are five players that stand out from the rest. They don't often lose to players outside the top five. "Within the next couple of year's I think the gap [to the top five] is going to get closer. Those guys are going to be on their way out and it's about looking to the next crop of players to come through and take it to them. "I'm hoping that I can be one of those players." Simpson, who will represent Guernsey at his fourth Commonwealth Games in Glasgow this summer, beat England's Adrian Grant, former world number nine, for the first time in his career on Tuesday. "I'd never beaten him before," Simpson added. "It was a big match and I was very pleased with that."